After careful analysis of antique rugs from the 1800's, I have reproduced some favorites from this era. To recreate the antique quality I use a finer weaving scale of 5 to 6 rows per inch and choose cloth typical of the era, sometimes over-dyeing or bleaching fabrics to approximate aging. Jacob Hiestandt (JH1) was reproduced from a photograph of an antique carpet in Winterthur Museum’s collection. Additional colorways were developed to complement this wonderful design that features a dark and light “log cabin” element in the center of each stripe. The documentation for this warp-faced design is a lovely faded antique rag runner found in central Pennsylvania. LP4 - Khaki and Tan patterned ground with Blue, Dark Navy, Black, Tan, Khaki, and Denim stripes. 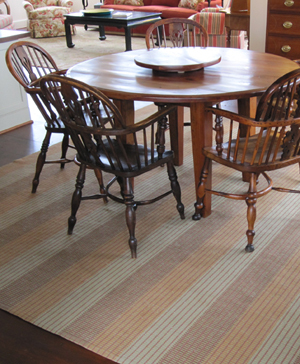 A warp-faced design of alternating small bars and blocks adapted from an early Pennsylvania rug. 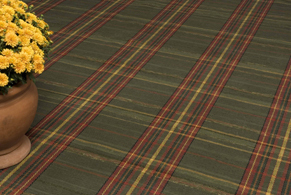 Venetian carpet was the most popular rug choice in the first half of nineteenth century America. Its distinguishing characteristic is the brightly colored striping that occurs in the warp threads spaced so closely together that they actually cover the filler or weft. There is little evidence that these rugs were ever produced in Venice, but the name could have been associated with the reputation Venice's many dye houses had for their brightly colored fabrics. 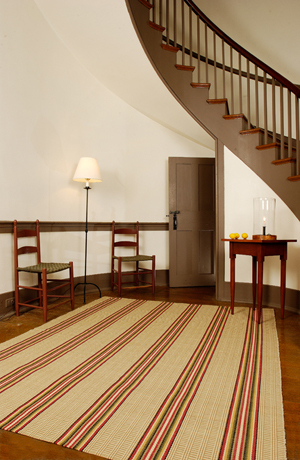 Our rugs capture the essence of these handsome striped carpets and are extremely durable at 36 warp threads per inch. 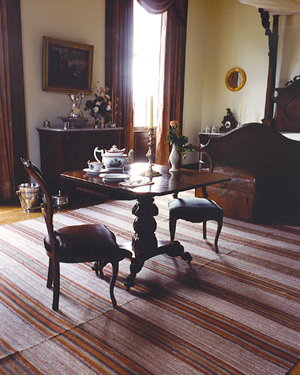 Federal Hill was reproduced from an antique rug in a private collection. After reweaving the deteriorating original, I decided to reproduce the lovely hues in this striped rug with “hit & miss” background. 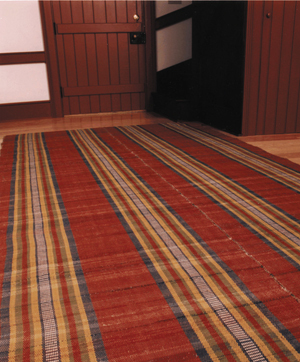 See Ordering Info for more information ordering custom-sized rugs and finish options.